Nobody seemed to want to own up to it, but there it was. 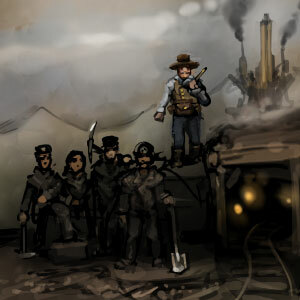 A furious order came from the Prime Minister – mining was the order of day, and so it would be done. A site was chosen. A large, rather ominous looking mountain. The engineering firm of Trumbungle and Sons were sent in to configure the drill on behalf of Her Majesty, and to position it over the target site. Mr. Trumbungle, an unlikely looking sort with a pair of massive white sideburns and unpleasantly decked out in a hat that could have only been in fashion some three seasons ago, scratched his head as he positioned it. The first problem in the mine occurred when the canary decided NOT to pass out, and instead started speaking in tongues. The men fled, and just in time; a stream of foul, noxious corrosive gas belched out of the mineshaft and three men were lost, including the Overseer, Jeremiah Grindingpile. His son, a young man entering the mine for the first day, would never enter a dark room again. When the work party assembled the next day, under the direction of a new Overseer, Leonard Badgertax, the new Overseer knew what had happened. It was a tragedy, but it happened. Sometimes a man would never return to the mine. “Still,” said Mr. Badgertax, as he thoughtfully polished his monocle, “it is a well-known proverb that our lives but rotate through the celestial orbit by the mechanical power of the Holy Cog. The Cog brings fortune into our lives, as tragedy exits our orbit.” Mr. Badgertax, it must be said, was not a particularly religious man; his wife made him go to church every weekend, and he would often fall asleep in the open air pews, dreaming of strange whirring machines and better days in the taverns of the Capitol City. Still, he did like the proverbs, and it was with this in mind that he set forth into the mine, to see what they had uncovered. Any man entering the mine, he remarked, would start to believe in the Holy Cog. A terrible madness gripped at one – the remnants of the gas, perhaps, or a sign of the unspeakable horror that occured there. Perhaps it was the presence of the Crustborer itself, always digging, always drilling ceaselessly, its dull rumbling vibrations echoing through the cavern. Perhaps it was the presence of the strange glowing rocks that the miners started to unearth – so hot to the touch that they had to carry them out with tongs, and so full of a wondrous and yet disquieting potential. Perhaps it was the coffin. The first sign that anything was wrong with the coffin was when the Crustborer hit it and the drill stopped working. A puzzled Mr. Trumbungle gingerly navigated his way into the mineshaft, being the only one who fully understood the workings of the machine. After all, was he not the one instructed with its care? How could a bit made of Cavorite stop? Cavorite should have gone through anything like a bowl of steaming hot Crimble through the insides of an urchin. “I don’t understand it at all,” he said. “Why would you?” asked Mr. Badgertax. Mr. Badgertax did not think highly of Mr. Trumbungle; after all, a man who wore a hat from three seasons ago could scarcely be said to care about anything. He thought of his own hat, recently purchased with his Overseer’s salary; a fine indulgence to be sure, even if his wife hated it – and even if, rather suspiciously, the priest at the Church of the Holy Cog had been delivering a sermon about vanity recently, and had pointed directly at his hat while shouting about Blasphemous Edifices. Right now, his eyes were on the coffin. It was slightly larger than a man’s coffin might be, and made of a strange and somewhat off-putting bluish-purple metal. A series of pipes ran across its sides, in and out of the coffin like chains around a condemned prisoner; made of some kind of glass, but peculiarly clear and full of a black fluid that seemed to move through the coffin as if propelled by an unseen water pump. Underneath the chains was the art – a fine piece of craftsmanship to be sure, even under the untrained eye of Mr. Badgertax, but there was something not quite right about it. The front of the coffin depicted the body of a man in repose, but with a strangely gaunt and elongated face, and no real sort of nose or mouth at all. Worst yet was the eyes. Pure white, with no pupil or iris. One of the strange, long hands on the coffin was depicted as holding a rod; the other, a scroll. Strange cuneiform covered its sides. It felt alive. Mr. Badgertax touched the metal gently, and it felt cold and clammy, like touching an oyster. When he tried to pull his hand away, it felt like something was stuck to it. He wiped his hands on his trousers, the occult nature of the problem unconsciously causing him to betray his lower-class roots. “Well,” he said, “Let’s get it out of here.” The labourers, of course, had all run off to the pub, probably trading eerily glowing rocks for gin and no doubt letting the whole bloody town know what was going on in the mineshaft. “What about Standing Order One?” asked Mr. Trumbungle. “All important discoveries of a strange and unusual nature should be reported immediately to the Ministry?” sneered Mr. Badgertax. “Come on. The Cog rewards those who reward themselves.” The two men managed to lift the coffin out of the rock where it was buried and carted it outside. The townspeople were not sure what to do with the coffin. After all, it was awfully strange. Men of science and ambition eyed it greedily in stockpile D where it lay – what mysteries did it hold? What was the fluid that coursed through its pipes, and what propelled it? They studied the coffin carefully, measuring its every side and the circumference of every tube. They tried to open it, but it would not open; a sample of the fluid from the pipes was extracted, and subjected to the most rigorous scientific processes possible without actually tasting it. Learned men bombarded it with rays from the Roentgen Device, and they subjected it to Voltaic Energies. A man from the Royal Society came by, tut-tutted at it, and was never heard from again. Urchins, selling matches on street corners, compared notes – it was true, was it not, that people were buying more matches than usual? Surely, it was a sign of the times. The coffin was creepy as hell. If the fluids from the coffin were to be connected to any factory in Shiveringhope, via a Number Four Pipe, and fed into the main processing line, the productivity of said factory would improve by a factor of ten. Many people wished to leave the coffin alone. Put it back in the mines, they said, and bury it deep. Let’s forget it we ever found it. The Empire Times, though, had other plans. In a damning and blistering editorial – plus, of course, the usual contributions to the Letters to the Editor by Norman, whoever he was – the Times lambasted the administration of Shiveringhope, the Prime Minister, and – for good measure – the Whigs. Surely, they said, a few weird dreams and the fact that the coffin was provably disturbing was no reason to stop anyone from harnessing its powers? Surely, if a few people suddenly went mad and found themselves vivisecting the cat, these little tragedies would be well outweighed by the glorious new economic boom that would be unleashed by the mysterious powers of the Fluid? Was it not the Prime Mininster’s responsibility – yea, and the responsibility of all men of industry and ambition – to demand, fervently, that the coffin be employed? It should be mentioned at this point that nobody has actually seen the Editorial Board of the Empire Times in twenty-three years. A lot of strange things have been happening in the Capitol City lately, and the offices of the Empire Times are never opened any more. All that can be heard is a curious scuttling, as if of a thousand tiny insect feet tripping across the pavement – and fresh newspapers appear, sporadically, outside the Empire Times offices for distribution to the colonies. After much discussion, it was decided that the problem of the coffin should be redirected to the business tycoons. After all, nobody is more qualified to use strange and mysterious discoveries for the good of the Empire than stalwart men of business. Naturally, the capitalists immediately started to lobby for the coffin to be hooked up to their factories, with each man making a strong case for his industry to receive the coffin’s rewards. Finally, the frazzled bureaucrat in charge of of Shivering Hope, one Zechariah Cogswotter by name, decided that the thing to do with the coffin was to use it to address the colony’s pressing pipe shortage. Steam was at a premium; factories were competing for resources, and the state of the plumbing was dire. Lines would frequently break as too much steam from the generators was pumped through the system, and breakdowns in production were frequent. More plumbing, of the highest quality, would surely benefit the colony more than any of the other pressing needs. The workers at the Bollox Cogsbronze Memorial Pipe Factory were not necessarily thrilled to have the coffin hooked to their building. It sat, attached to an outer wall, and the fluids contained therein slowly dripped and seeped into the mechanisms. Still, productivity increased as promised, and within hours vast quantities of pipes started rolling off of the mechanical presses at a rate that seemed impossible only days before. Zechariah Cogswotter looked at one of the specimens in Stockpile F, and tapped it with one gloved finger. “That’s cursed steel, that is,” he said, and wandered back to the bar. Zechariah had been a bureaucrat for a long time, and he would continue to be after Shiveringhope was under the soil. Such was the way of the bureaucrat. So often they know the truth, but are powerless to affect change. For a time, this seemed like a good arrangement. The factory churned along, and pipe continued to be laid at a frightening rate. Soon, the town had more piping than the frazzled and overworked engineering crews could reasonably be expected to install, especially when so many of them started dying in mysterious and bloody pipe-installation accidents – their heads crushed in, or otherwise injured and pulped in horrifying and spectacular manners. Still, productivity was up! It was a net positive, and the capitalists of the colony of Shiveringhope counted their money in their change-houses and drank heavily of finest Stahlmarkian Brandy. It was one of these capitalists – in fact, the financier responsible for the pipe factory, Marian Ravensprocket – who first heard the noises coming from the pipes. She was passing by a particularly fine steam distribution plant on the way to the bar, and stopped to admire her factory’s handiwork, when she heard a noise that, at first, she assumed to be a carrion buzzard. (There had been an outbreak of carrion buzzards recently.) After listening some more, it sounded like a guttural whisper, like that of a small child. “Cogdamnit,” swore Marian Ravensprocket, no doubt concerned with lawsuits. “Hang on! I’ll try to get you out.” She wasn’t sure how anything could be alive in the pipes – they were, after all, very thin, but the voice begged her to hurry. She ran up to the pipe and touched it. Nobody entirely knew what happened to Marian Ravensprocket after that, but a worker at a nearby ingot press was horrified when her liquified body, clothing, hat, and watch-fobs all flowed out of a Steam Turbine Emergency Fluid Intake Disposal Vent. An inquiry was called for. 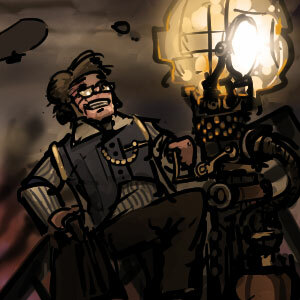 The coffin was clearly the cause of the problem, and it was decided to take the thing away from the factory until such time as the Clockwork Empires needed to be saved, in their time of need, from inadequate plumbing at any cost. When the engineering crew approached the factory, they made a number of observations, which they carefully wrote down and delivered to the desk of Zechariah Cogswotter. The coffin has bonded with the factory, and impossible to detach. In fact, the factory was now impossible to demolish. The factory was now producing massive quantities of pipe, unaided, and apparently without input materials. The workers who were supposed to be working at the factory were no longer showing up for work, and were instead taking large quantities of pipe somewhere out beyond the colony walls while chanting in tongues. In conclusion, the report begged for the Overseer to send, at once, for the Anti-Paranormal Investigation Squadron. Zechariah Cogswotter had his doubts that it would do any good – it was much too late for that, and he’d seen this sort of thing back in Quaveringspring, and before that the colony of Old Mushroomhood, which had been rather badly named in hindsight. Still, he clambered up to the Heliograph Tower and sent the summons himself, then started packing his bags in preparation for departure and the collection of his inevitable medals and trophies. With a glorious bollocksing like this, he might get another country house for his depressed alcoholic children to be stored in. The Anti-Paranormal Investigation Squad showed up three days later at the outskirts of town; a Superintendant and five Investigators of indeterminate origin and gender, each wearing the goggles and terrifying leather beak-mask that denoted their rank in the organization (Constable, Sergeant, Inspector, Inspector-Superintendant, Superintendant, Chief Superintendant, Sub-Commander, Commander, Deputy All-Purger, All-Purger, Incinerator, High-Supreme Incinerator, and the terrifyingly masked Grand All-Commissioner) They came armed with a Voltaic Lightning Spitter, a very large Phlogiston cannon, and the Very Small Torturous Prongs (by which a confession may be extracted from even the most corrupt cultist.) They approached the factory in deathly silence, and the citizenry (many of whom feared the Very Small Torturous Prongs) stayed out of the way. After inspecting the scene of the crime, it was determined that there was a very serious problem, oh yes very serious, and that everything needed to be dealt with immediately or it would only get worse. More Investigators were sent for, bearing more weaponry, and a determination was made: there was a terrifying cult in the colony of Shiveringhope. It centered around the worship of that coffin, and even now corrupt men and women were doing the infernal thing’s terrifying and irrational bidding. The only thing to do was to stamp it out, and at all costs. Half of the investigators set off to determine who, amongst the men and women of the colony, were hypnotized by its baleful influence; this was determined by repeated courses of Very Small Pronging, at which point just about anybody would give in and admit to anything. One man even admitted to being the mastermind behind the Science Criminal Gang, and was promptly sent to Science Prison. The other half of the investigators, upon considering the situation, decided that the best thing to do was to get the coffin open and have a good look at what was inside – and then, quite possibly, prong it. Creativity doesn’t get you very far with Her Majesty’s Anti-Paranormal Investigators. Still, however, the coffin would not open. The Deputy All-Purger, who had arrived personally to inspect the coffin, grabbed the Very Small Torturous Prongs and proceeded to apply them violently and with great skill against the hermetically sealed exterior. After fifteen disturbing minutes, he finally stepped back and admitted defeat. Then, as he paused to adjust his mask, a creaking noise was heard from the coffin. The pipes retracted back into the frame of the device, and a great hissing of steam and other boiling elixirs emerged. Then, slowly, the front of the coffin started to slide open. Like all good members of the constabulary, the Deputy All-Purger decided this was a good time to bang on the front of the coffin and shout “Allo, allo, allo!” at the top of his lungs at it. At this point, with superhuman speed, something – nobody really knew what it was, and the only eyewitnesses surviving described it as being somewhere between “a hand with thin, elongated fingers and decaying greying flesh” and “the most deformed egg I’ve ever seen in my life” – reached out, grabbed the Deputy All-Purger by the leg, and flung him into the coffin. The lid slammed shut and a furious banging and crashing was heard. The rest of the Investigators gathered around, considering the situation. They were fairly surprised when the coffin opened and something clambered out of it. It may have looked like the Deputy All-Purger, and perhaps it was the Deputy All-Purger, but it was more like something was manipulating his body like a slightly incompetent puppeteer. It must still retained some semblance of the Deputy All-Purger’s brain, though, for deep inside the… something… was one overwhelming desire – to purge. To purge everything in Shiveringhope. 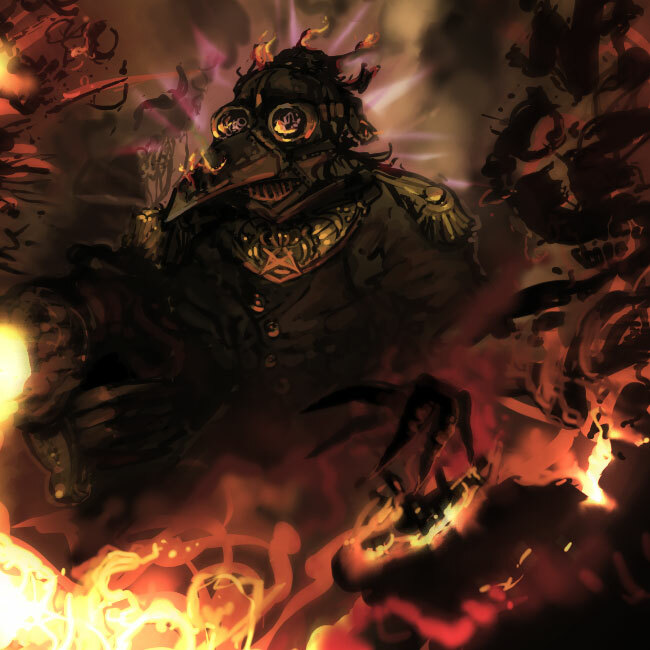 Zechariah Cogswotter, already packing his bags into the Escape Zeppelin (for Bureacrats only), was not dreadfully surprised when the former Deputy All-Purger picked up the Phlogiston Cannon with one hand and fired it at his former colleagues. They exploded, almost instantly, in a shower of flaming body parts and burning leather mask-bits. Those are the most beautiful tags in all tagdom, praise and thanks to the Holy Cog. Oh. My. Diggle. That is just too awesome. It also sounds like this will be a perfectly regular game of CE, and that makes me happy. Chaos is good. All Purging is good. on the plus side, the next colony in the area gets free unlimited pipes courtesy of a nameless abomination. Zombified workers are the future. Yeah! These stories alone are worth the price of admission, I think. Totally agree. Please keep these coming; they really brighten up my day! Just imagine if they had hooked the coffin up to the factory that produces novelty stuffed bird-creature ornaments. The implications are…unpleasant to consider. Wow, what a fantastic read! Cannot wait to staple myself to a chair and absorb the hell out of this game. Hopefully, not all unearthed items with mysterious origins will harmful for our colonies, or at the very least we’ll be able to bend some of the items we find to a useful purpose. What could be more useful than pipes? Even-More Cursed Pipes – like electric fences, but better! I think I may have mentioned this before, but you guys are fantastic. Things like this are why. Keep doing what you’re doing! Thank cog there are game devs like you (as well as human beings such as you) in the world! This is oh so great oh so great. Ohh I do hope we can make these purging attempts of our own power. ‘Impossible to demolish’ is a relative term, yes? I mean, if I happened to be in the business of producing Voltaic Inducers and Voltaic Inducer Accessories, it would be a shame not to put them to use when they are most needed. Also, I wonder if the incident of disturbing dreams was felt throughout the colony or only in the vicinity of the artifact? If it were close-ranged, it would be interesting to make attempts to sequester that sort of effect away from the main populace so that Industry does not become a nuisance. And isn’t it fun to have a queer factory at the edge of town. Maybe the neighbors suffer a few anxieties, of course brought on only by wholesome Cogly machinery noise. They’re probably just sensitive. can we shoot our own citizens or will we have to build a place to send all the insane (or just stupid) ones. Also can we build Phlogiston Cannons. They sound fun. Asylums, baby. Asylums all the way. And the phlogiston will naturally have the required negative mass implied by burning substances losing weight, so that we can build Glorious Phlogiston Repulsion Towers that push everything away from them via negative gravity in a glorious display of uselessness? Will this be completely re-enactable ingame? – Digging does *not* use the Dwarf Fortress model. There are mines, you put them on the overworld, people will go into them and out of them. This is because 3D digging is hellishly confusing; look at Game of Dwarves for an example, or even stuff like Towns or Gnomoria. The plan, currently, is to maintain an internal simulation of What Lies Beneath The Earth, and miners will just sort of mine this intelligently. Half of Dwarf Fortress gameplay for mining just consists of putting down pilot veins and hoping to strike something, then manually designating digging targets around promising veins of gems or minerals; between this being a repetitive and boring action, and the visualization problems, we just decided to automate the whole thing. – You will find terrifying things in a variety of unusual circumstances. One of the earliest concepts we had for the game was of an artist creating a statue so terrifying that they had to throw it in the lake; unfortunately, it got into the water supply and the entire town’s alcohol supply was subsequently contaminated by the taint of madness. – Most things can spread madness and horror. This does, in fact, include pipes. – Her Majesty’s Anti-Paranormal Investigation Squadron is a very real thing. You can probably summon them with prestige, or they may just show up on their own. Like radiation therapy for cancer, sometimes the cure is worse than the disease. – Currently I am thinking things that broadcast maddening effects will do so in a radial fashion from their point of origin, with varying sorts of attenuations and strengths. One slightly mad pipe is probably not as bad as, say, a very mad statue. My hype-ometer is quickly breaking and my patience is fading. I want to live my own nightmarish dreams of colonization for the glory of empire and modern science. On a related note I carved a diggle jack-o-lantern this year, just need to battle with the maddening science of getting the picture off a digital camera card. Please keep up the fabulous efforts. I’m already starting to wonder if the Empire Times has been taken over by the…Shan? Spawn of Abhoth? Lloigor? Worse?…in order to facilitate the restoration of their fellow conspirators from long ago. All they have to do is agitate the colonies (the more malleable ones, anyway) into mining into the wrong places. Finally got around to reading this. Excellent story! I’m now anticipating the game’s release even more eagerly than before. …any chance of the dev team using the coffin to speed up development? I mean, what are the chances of an experiment in coffin-assisted production going horribly wrong twice in a row? Wow. It’s stuff like this that really excite me. Good stuff! “The first problem in the mine occurred when the canary decided NOT to pass out, and instead started speaking in tongues.” This has got to be my favourite moment in the entire history of lovecraftian horror. Incidentally, should we infer from this story that nobody in the entirety of either the Anti-Paranormal Investigation Squadron or the Ministry reads the Empire Times?